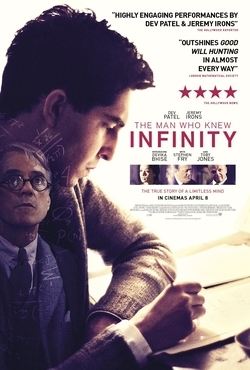 Last night I attended "The Man Who Knew Infinity" a film based on the real life story of Indian mathematician Srinivasa Ramanujan FRS, who was admitted to Trinity College at Cambridge University in 1914. A Film Trailer is available. Dev Patel gives a believable portrayal of a mathematical genius not recognized, Devika Bhise as his devoted but neglected wife and Arundhati Nag as an Indian mother. These relatively unknown actors succeed in being noticed alongside the star power of the movie. Jeremy Irons as Professor Hardy made me think of this as Brideshead Revisited (Revisited), while Stephen Fry as Sir Francis Spring seemed to be reprising his Black-adder role and Kevin McNally as Major MacMahon looked like he was in Dad's Army. But Jeremy Northam steals the show as "Berty" (Bertrand Russell). The India and Cambridge of the 1914 are lovingly reproduced, with perhaps a little too much sentimentality. India looks too clean, with too many elephants and not enough people. The Cambridge dons are a little too nice. Filmed on location a Trinity College Cambridge, I was able to relate to the strictures of not walking on the grass (I was invited to by one of the fellows) and the gossip at high table (the food is not that bad). This film manages to make mathematics interesting (just), but perhaps outstays its welcome and could do with 20 minutes being cut out. The film is based on the book "The Man Who Knew Infinity: A Life of the Genius Ramanujan" by Robert Kanigel (1991). The Man Who Knew Infinity is on now in cinemas across Australia. My ticket was courtesy of Nixco. ps: If visiting Cambridge and not having an academic connection, you can stay in a college through University Rooms.